BETHLEHEM (Ma’an) — The UN’s Palestine refugee agency UNRWA on Thursday evening declared a state of emergency in Gaza City amid massive rains that have shut down normal life in parts of the besieged coastal enclave’s largest city. 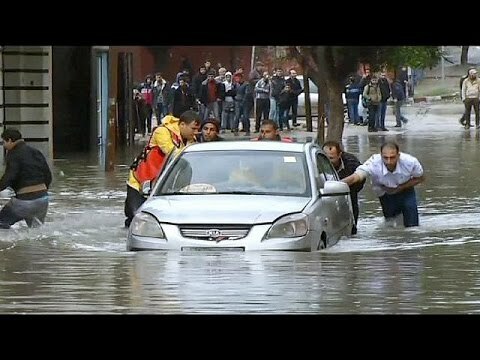 A major storm over the past week has filled the streets of Gaza City with water and sewage, causing further misery for the more than 100,000 Palestinians left homeless — including nearly 30,000 still staying in emergency shelters — from Israel’s massive offensive over summer that also left nearly 2,200 dead. UNRWA said in a statement that 63 schools across Gaza City and 43 schools across the Northern Gaza Strip governorate had been closed Thursday due to the flooding. Hundreds of residents in the Sheikh Radwan neighborhood of Gaza City had also been evacuated due to the rise of a “storm water lagoon” that had flooded many homes in the area. “The flooding is exacerbating the already dire humanitarian situation in Gaza caused by blockade and the unprecedented destruction from the latest Israeli offensive,” the UN agency said in a post on its Facebook. Gaza is prone to severe flooding and heavy rains in early Dec. 2013 led to the displacement of at least 40,000. The floods are exacerbated by a chronic lack of fuel that limits how much water can be pumped out of flood-stricken areas. The fuel shortages are a result of the eight-year-old Israeli siege, which also limits the import of other kinds of machinery related to pumping and sewage management that could help Gazans combat the floods. UNRWA said on Thursday that it had provided 60,000 liters of emergency fuel to pumping stations in Gaza in response to the floods. Thursday marks the fourth straight day of unusually heavy rain across the region, causing temperatures to dip across Palestine. The West Bank has also experienced flooding as a result of the storm, causing difficult driving conditions in many of the region’s hillier villages and cities. The floods in the West Bank, where Israeli restrictions on import of machinery and other construction essentials are much lighter, have caused anger and annoyance among many. Despite a slew of recent projects intended to improve urban infrastructure across the region, the continuing flooding suggests these have not borne fruit. The general manager for projects in the Ministry of Local Government Muhyi al-Din al-Areda told Ma’an there had been negligence in the administration of projects responsible for constructing many streets where the problems were occurring. Al-Areda added that the Ministries of Public Works and Local Government had allocated $3 million to develop municipalities and drainage. Al-Areda said that the flooding had hit cities in the northern parts of the West Bank more severely than any other. The worst hit has been Qalqiliya as it is surrounded on all sides by the Israeli separation wall, making water-pumping a complex and difficult task. Rains are expected to end by Friday morning, with temperatures rising as well.